With the divine grace of A.C. Bhaktivedanta Swami Prabhupada, in 1989 Delhi NCR found their first ISKCON temple named as श्री श्री राधा पार्थसारथी मन्दिर and popularly called इस्कॉन मंदिर दिल्ली. 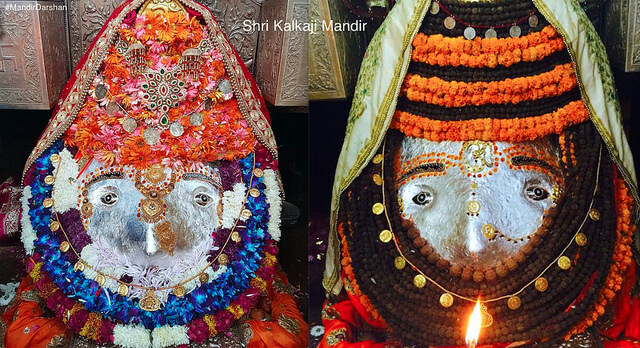 Janmashtami is the biggest festival of this temple, 8 lakh devotees visiting the temple for a darshan of Lord Krishna. Beautifully placed Bhagwan Narsingh with the story of bhakt Prahlad and his father on thigh of Lord Vishnu. Light effect and placement of statue is awesome. Most attractive utility of main prayer hall is a huge jhumar which is main lightning source of this hall. A beautiful view of Shri Garun parikrama by devotee one by one steps over lotas. 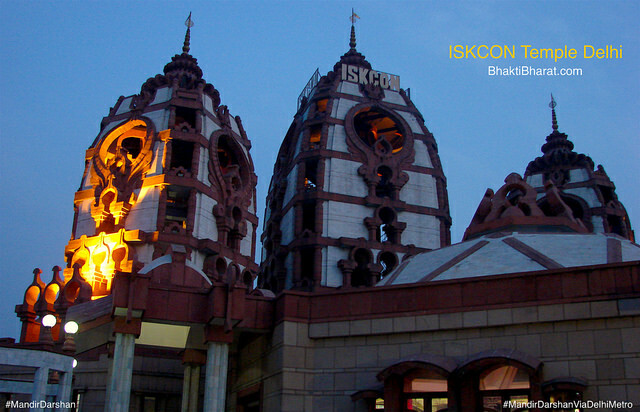 Temple is organized by the spiritual society ISKCON, therefore name of the society labeled at the top of main middle Shikhar. Followers of Abhay Charanaravinda Bhaktivedanta Swami Prabhupada (अभय चरणारविन्द भक्तिवेदान्त स्वामी प्रभुपाद , 1 September 1896 - 14 November 1977) daily worshipped at 7:30 AM as Guru Puja. Prabhupada is initiator of Shri Hare Krishna movement. Roof of prayer hall is beautifully decorated with two layer of lotus artchitecture, one is jhumar and outer leaves dipicted by painted wall. Nearest Shiv temple with green area from one of the window in ISKCON art gallery, under the concept of Mandir se Mandir Tak. Parikrama Shri Krishna art gallery shows various aspects of the Hare Krishna movement, vedic philosophical and cultural heritage. 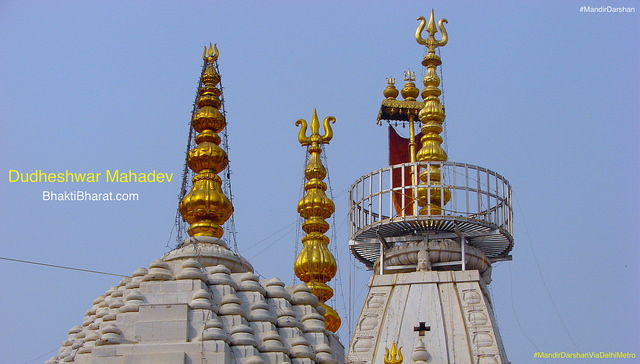 Neela Chakra at the top of all three vimans with similar concept of Jagannath temple. The museum shows various aspects of the Vedic philosophical using sophisticated morden robotic shows. These shows were designed primarily by the devotees from around the world. 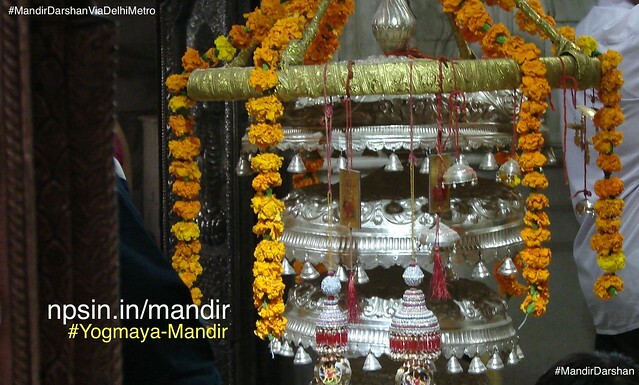 A lotus shaped large ghanta(bell) under two semicircles main gate structure. With the divine grace of A.C. Bhaktivedanta Swami Prabhupada, in 1989 Delhi NCR found their first ISKCON temple named as Sri Sri Radha Parthasarathi Mandir and popularly called ISKCON Temple Delhi. हरे कृष्ण हरे कृष्ण, कृष्ण कृष्ण हरे हरे! हरे राम हरे राम, राम राम हरे हरे! !